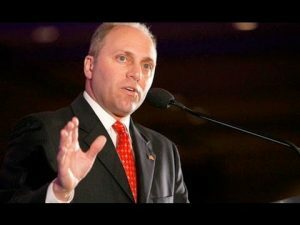 Steve Scalise, the House’s majority whip and a leading conservative in the Republican Party, spoke today (Sept. 28) after walking into the packed chamber with the aid of crutches. He was shot June 14 at an Alexandria, Va., park as GOP members practiced for the annual Congressional Baseball Game for Charity. His ability to return to the House “starts with God,” Scalise said. “When I was laying out on that ball field, the first thing I did once I was down and I couldn’t move anymore was I just started to pray. And I tell you it gave me an unbelievable sense of calm, knowing at that point it was in God’s hands.